Club Meeting on June 10! Please join us on Monday June 10 at 7pm for a meeting of the Spring Valley Lemon Grove Democratic Club. Our featured guest speaker will be Mayor Mary Sessom. She will be joining us to talk about regional planning on SANDAG and her roles related to the airport authority and mayor in the city of Lemon Grove. 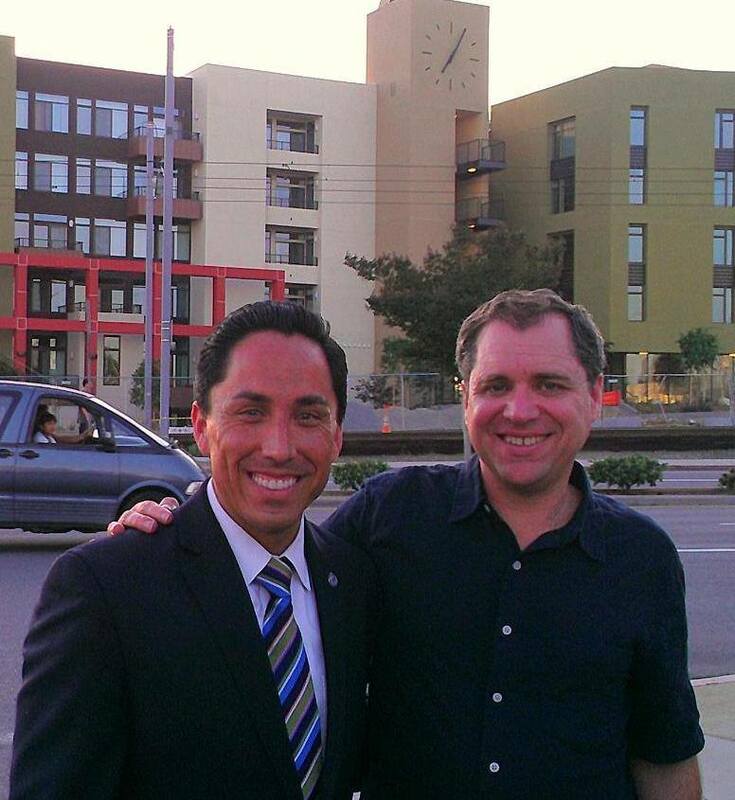 Todd Gloria and George Gastil in front of the soon to be open Citronica One housing development May 13, 2013. At our May 13 meeting the SVLG Democratic Club voted to give incumbent San Diego Unified School Board Member Kevin Beiser an early endorsement. He is up for re-election in 2014. We also heard from San Diego City Councilman and Council President Todd Gloria who shared information with us about regional issues such as transportation and Balboa Park. Thanks for joining us Kevin and Todd! The June 10th meeting of the Spring Valley Lemon Grove Democratic Club will be at 7:00 pm at the Transit Union Hall, 7840 Lester Ave in Lemon Grove. Our speaker will be Mayor Mary Sessom, a leader in SANDAG as well as in her own city of Lemon Grove. Did you know that the SD Democratic Party has an official email newsletter? Follow the link to read the current edition of The Blue View, peruse the archives or subscribe to receive the newsletter via email. Just select the Join Us Now button on the top right of the page. To guarantee your place, at the annual San Diego Democratic Party Gala and Awards Ceremony on Saturday May 4, you must make your reservation by the deadline tomorrow: Tuesday, April 30. You can purchase tickets at www.sddemocrats.org/dinner or call the office at (858) 277-3367 to RSVP. Join San Diego Mayor Bob Filner, our county’s entire Democratic Congressional delegation, the evening’s award winners, and hundreds of other fellow Democrats on May 4 at the Hilton San Diego Resort Mission Bay. It’s a night to celebrate victories and look ahead to future success! Did you know that you can review the current Lemon Grove city council meeting agenda on the city website? It’s a good way to keep up to date and find out what the council will be addressing in upcoming meetings.